A Quick Tip: Be Yourself! Hannah here wishing you a very happy Friday! Hey, have you been in a creative rut? 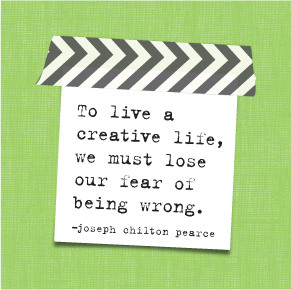 Do you feel like you've hit a wall in terms of your creativity? It happens to the best of us. Remember that your creativity can strike mysteriously but to maintain your mojo sometimes we need to be intentional with our creative juices. Plan to do something this weekend that you've never done. Go some place for lunch that you've never gone before. Wear your hair a different way. Make a creative project that you never tried before.